1. Introducing our website Accordance with the law n ° 2004-2005 of 21 June 2004 on confidence in the digital economy, our hotel website created by Marotte, owner of the site www.hotel-marotte.com, provides public information about our business. Possibly modifiable, we invite you to consult our disclaimer as often as possible in order to read it frequently The site belongs to www.hotel-marotte.com Walti Estelle - whose headquarters are located at the following address: 3, rue Marotte 80000 Amiens. Natural or legal person, Estelle Walti is responsible for the publication, whose email address is: amiens@hotel-marotte.com The webmaster, Estelle Walti, is responsible for the administration of the site, including the e-mail address is: amiens@hotel-marotte.com. 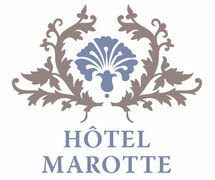 The site www.hotel-marotte.com is hosted by Jimdo, whose registered office is located at the following address: Germany. 3. Products or services offered by www.hotel-marotte.com In keeping with its policy of communication, www.hotel-marotte.com aims to inform users about services offered by Estelle Walti, while striving to provide accurate information on its activity. However, inaccuracies or omissions may exist: the company shall in no way be held responsible for any errors present on the site www.hotel-marotte.com. 5. Intellectual property and website content The editorial content of the website www.hotel-marotte.com belongs exclusively to Estelle Walti. Any infringement of copyright is punishable under Article L.335-2 of the Code of Intellectual Property, with a penalty of 2 years imprisonment and a fine of € 150 000 The site www.hotel-marotte.com not be blamed if abusive, racist, defamatory or pornographic traded on interactive spaces. The company also reserves the right to remove any content contrary to the values ​​of the company or the laws applicable in France. While browsing the site www.hotel-marotte.com, the user accepts the installation of cookies also possible on his computer. 6. Personal data and respect your privacy and your freedoms Any information collected on the website www.hotel-marotte.com are within the requirements related to the use of our platform, such as the order form or application for registration to the Newsletter. Moreover, unsubscription is done through the Newsletter link at the footer. Estelle Walti undertakes not to transfer to any information about users of the Website in any manner whatsoever (sale, exchange, loan, lease, gift). Accordance with the law "and Freedoms" of January 6, 1978 amended in 2004, the user has the right to access and rectify information concerning him right can be exercised at any time by sending an email to amiens@hotel-marotte.com address, or making a request by mail to the following address: 3, rue Marotte 80000 Amiens.